The virtual tasting tour of Berlin’s wild plants continues! To get started, I’ll answer Sara’s question about the plants from this walk: which are native to Germany? Our tour guide Elizabeth said that most of them are, but many are also very widespread and can likely be found near New York as well. I’ll include a little more info about the plants’ habitat this time. Above is the plant whose flavor I found the most intriguing: ground-ivy (Gundermann in German). 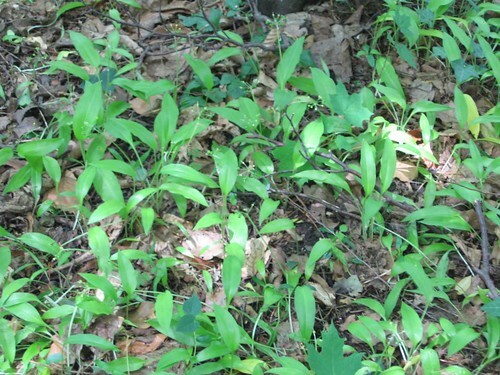 It has small, rounded leaves and little purple flowers and grows both in woods and grasslands. It has medicinal benefits, but Elizabeth also said it can be used as a kitchen herb. I thought the young leaves had a very bewitching flavor and munched several of them, taking more home to eat on buttered bread for lunch. They taste very herbaceous, almost like cannabis or hops, and also quite peppery. The hops similarity was apparently not lost on the Saxons, who used called ground-ivy “Alehoof” and used it instead of hops to improve the flavor and shelf-life of their beer, according to Wikipdia. The same source tells us that this plant also has a whole host of other nicknames (Creeping Charlie, Catsfoot, Field Balm, Run-away-robin, Gill-over-the-ground, and Tunhoof) and that it is native to Europe and parts of Asia but is now common in much of North America as well. 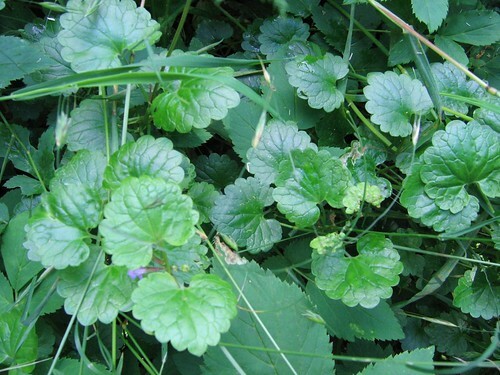 Judging from how much of the article is focused on ways to kill it, ground-ivy is often perceived as a weed. But a weed is in the eye of the beholder (or hungry forager). It is this foliage that is good to eat, and it can be enjoyed in large quantities. Elizabeth suggested using it in place of parsley with tomatoes or potatoes, and Wikipedia says it can be prepared like spinach too. 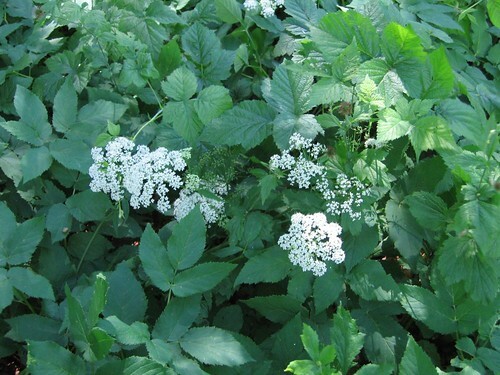 Unfortunately, while it is a natural part of Europe and north Asia, it is apparently becoming a problematic invasive weed in the U.S. It’s on the Plant Conservation Alliance’s Least Wanted List! Maybe American plant foragers can consider that another reason to eat it up. Ok, this one’s not a plant, but it’s growing on a plant. It’s the wood-ear mushroom of hot-and-sour soup fame! I usually buy it as shriveled up black things in a plastic package at the Asian market. I only found out recently that it grows in Germany and this was the first time I saw it in person. It seems to grow anywhere there are dead elder trees. 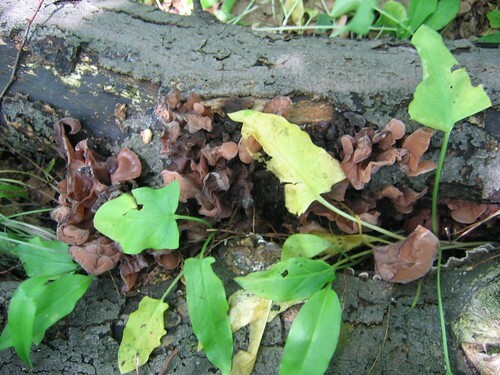 However, I won’t go further into the topic of mushroom collecting now, as it is a very serious topic in Germany and has many more enthusiasts than the more obscure activity of wild-plant-collecting. As our fellow plant artist Maz can tell you. Speaking of enthusiasts in Germany, this plant here also has many German fans, humble as it may look to the uniniated. German speakers call it Bärlauch, which means bear’s garlic, as does the Latin name, Allium ursinum. In English, it’s more commonly called Ramsons. It is loved for being one of the first edible plants to appear at the end of winter, and for its mild, pleasant garlic-leek taste. It is often used to make pesto or in other raw dishes, as its delicate flavor fades when cooked. People say that it’s easy to confuse Bärlauch with the poisonous Maiglöckchen (Lily of the Valley), Herbstzeitlosen (autumn crocus), and Ahornstab (wild arum or cuckoo pint). Here are illustrations of the former three. While the botanical illustrations – complete with roots, flowers and seeds – are easy to tell apart, you can see the similarity between the leaves, which is all that you see in early spring, the best time to collect Bärlauch. However, Elizabeth pointed out that the Maiglöckchen / Lily of the Valley always grows in pairs, and it and Bärlauch don’t like to share territory. In other words, once you’ve found one Bärlauch plant, its neighbors are most likely the same. As for the Ahornstab / wild arum, the undersides of its leaves have branched veins, while those of Bärlauch are parallel. But I think the easiest way to tell Bärlauch is obvious – crush it lightly and it smells like garlic! Unfortunately for our readers outside of Europe, this plant is only found here and in nothern Asia, in floodplains and woods. However, there is a similar delicacy in North America: wild leeks, also known as ramps, which I learned are celebrated with great fanfare in West Virginia and also eaten in Quebec. 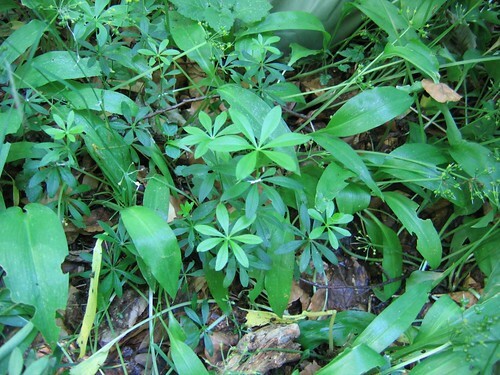 Finally, here is a plant that is more often imbibed than ingested: Waldmeister, or Woodruff (the flower-shaped one in the center of the picture). It’s traditionally used to make May wine – simply dry three sprigs of woodruff for 20 minutes to intesify their flavor, which increases as it wilts, and combine with a bottle of chilled white wine or champagne for thirty minutes, then remove the woodruff and enjoy. Bright green woodruff syrup is sold for seasoning the local low-alcohol beer Berliner Weiße and other drinks. However, because of concerns about the compound cumarin, which causes headaches in higher doses, commercial products with Waldmeister flavor are no longer allowed to contain real Waldmeister, only artificial flavoring. So if you want to enjoy real May wine, you should head to the woods and collect your own woodruff. Unfortunately it’s found wild only in mid- to nothern Europe and western Siberia. However, it can also be cultivated in the garden – pick a shady spot. I’m sure I left out many other edible plants from Germany, not to mention many that grow in New York and not here. Please let me know of your favorites! Until next time, cheers and Guten Apetit. Lovely overview! So glad you enjoyed the walk. Hi S, I realized that our walk experiences were probably complementary because you attended the beginning but had to leave early, while I arrived late and only caught the last hour (meadow and woods). So I’m glad we could compare notes via our blogs. And thanks again for the tip! Amazing! I knew central Europeans picked mushrooms, but I never knew more of the old habits of our hunter-gatherer ancestors survived in modern cities. Greeks also gather their own edible plants, which are totally unlike the ones I see here. Either we have different species due to the climate, or we pick different ones for who-knows-what historic reason. Hi Aristotle, thanks for the in-depth comment about foraging. Nice to hear that the tradition is alive and well in Greece. What are some of the plants you like to collect? I think many Germans have forgotten about the edible plants out there (people are sometimes skeptical when I serve them “rabbit food”), but many people still enjoy foraging for mushrooms in the fall. And restaurants, from high-end Nola in Denmark and to cozy lunch spot Einklang right here in Berlin, suggest that the tradition is coming back to life around Europe. Am curious to here more about what you collect in Greece! Well, the mushroom picking tradition is alive and well in the North of Greece, where mushrooms are more plentiful due to the wetter climate. During winter, all across the country you’ll find people picking wild greens, such as dandelion, which are boiled and served with oil and lemon or vinegar. Various tubers are also picked, usually for pickling. In the spring, Greeks mostly pick wild asparagus, daisy greens and nettles (yes, using rubber gloves). In the summer, it’s time for wild berries. Greeks don’t only pick flora, but fauna too. I don’t mean hunters, but gatherers – people go about in the fields or forests for snails or to the sea for barnacles, urchins and other animals found in the shallows or in rock pools. Save dandelion, which is the most common, many of the wild greens we eat have no English equivalent – I suppose I could provide pictures or their Latin names if you are really interested. Come to think of it, if I’m going to do all this work, I might as well put it all in a post and send you the link. How about it? Hi Aristotle, this is all very fascinating. Would you say that the majority of Greek people you know still forage in one way or another? Here, even with mushroom gathering, which most people still have some experience with, not so many people actually find a time and place to do it every year. As I mentioned, plants are even more forgotten and when I collected snails once, everyone at the table was quite squeamish. Yes, I would love to see a post on your blog with pictures of the plants you eat, and would be happy to write a short post linking to it. Keep me, well, posted! Don’t know about a majority, but if not, then a very large minority, especially in the villages and smaller cities. City folk sometimes do too, but when they can’t forage themselves they’ll happily buy wild greens (or snails) at the farmers’ market. As for the post, thanks, I’ll send you a link when it’s done. Keep up the good work.